Join us at Hacienda Golf Club on Monday, May 20! Join us for Lunch & Learn on May 2 to tour campus, meet current students, and have lunch with faculty and staff. Boy-centered academics. Individualized learning. Student success. Give your son the best start with SCA's early childhood program. Founded in 1889, St. Catherine’s Academy is a private, Catholic day and boarding school with a military tradition for boys in transitional kindergarten through 8th grade. 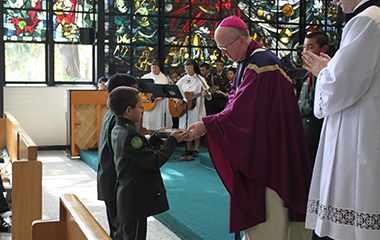 We offer the structure and values of a military school along with outstanding academics and a spiritual foundation based on the Dominican Pillars of community, ministry, study, and prayer. Our exclusive combination of programs gives our students a foundation for lifelong success. We are located in Anaheim, Orange County, California. Join us for Lunch & Learn on May 2 at 11:00 to see how SCA can help your son grow into a smart, faith-filled, confident leader! You'll have the chance to tour campus, meet current students, and have lunch with members of our faculty and staff. From tours to cadet shadow visits, we offer a variety of ways for you and your family to get know SCA. Click here to learn more and rsvp for an upcoming event. Our alumni are a constant source of pride. After all, you have been the heart of SCA since 1889! We invite you to get involved and keep in touch. This tab contains useful information for faculty and staff of St. Catherine's Academy. If you are looking for the staff directory, please click here. 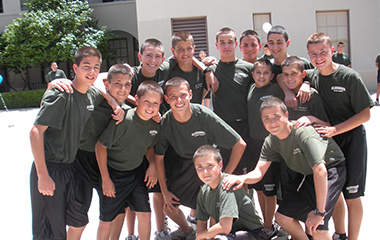 St. Catherine’s Academy, a Catholic school with a military tradition, builds within young men a foundation for success through a formation program, which is rooted in the Dominican charism and emphasizes faith, leadership, academics, and service. Founded in 1889, SCA is the first Catholic school in Orange County. The Dominican Pillars of community, ministry, study, and prayer are our foundation and just one feature that makes us a truly unique private school in Orange County. 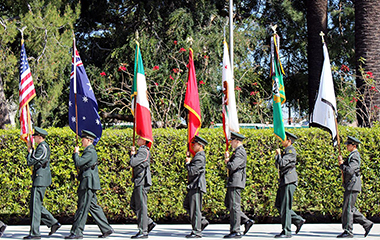 SCA offers the values of a military school designed for younger students. In our elementary military school program, students learn structure and self-discipline. 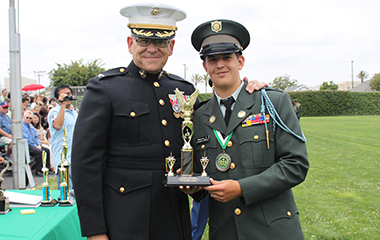 As our oldest cadets, 6th – 8th graders get more leadership experience than at other military middle schools. SCA is a leader among junior boarding schools with 24-hour supervision, structured activities, and a home-like environment. We are one of the few elementary boarding schools to begin accepting students in 4th grade and also offer middle school boarding school. SCA is one of the top boarding schools in the US, offering on-campus housing, specialized instruction for English Language Learners, and more. We are a home away from home for many international boarding students in 4th - 8th grade.